This entry was posted in Applications, Editing, Photography, photojournalism, Workflow and tagged Apple, FTP, iPad, iPad 2, mulitimeida. Colin Mulvany, photo editing, Photogene, photojournalism by Colin Mulvany. Bookmark the permalink. Good read and workflow. Here are a few links to look up in your iPad photo quest. Photo editing app not quite as good as Photogene. Also if you shoot RAW theirs an app called Pirawnha which will process raw images. If your interested in going wireless look a getting an eye-fi SD card and Shuttersnitch app. Rob Galbraith has great over view on his site on how to use the two together. Thanks John for all the links. I will get this CF card reader. Also Filterstorm Pro looks really good. I like the browsing features and will get it when it is released. Are you using the iPad in your day to day workflow? Because I like to work with RAW images the iPad only gets used in my daily workflow when I need to file to the web desk real quick. Then when I have time to set down I pull out the laptop, make a proper edit and file to the photo desk. 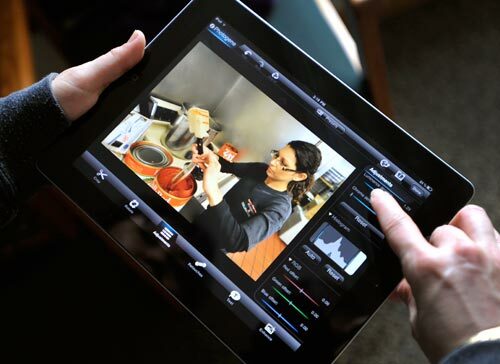 We’re the makers of piRAWnha, the raw image developer app for iPad. We’d love for you to check out our app. Please let me know if you’re interested. You can contact me via our site, http://www.piRAWnha.com. If you want to check us out on iTunes, please see http://goo.gl/o2ovM. To follow the above workflow I am assuming to do this you must set the camera to take both a jpeg and raw file rather than raw only. Is this correct? I love Photogene – and we just sent our students here at Stony Brook armed with the software on iPads for our study abroad journalism program. So far, so good. One of my chief complaints about Photogene – aside from the lack of batch processing options – is that it used to output photos to only about 8 megapixels. Anyone shooting even a D300s or something would be throwing away resolution. That’s all changed now in the latest update, which supports up to 21 megapixels on the iPad 2, even big enough for the 5D Mark II! I told my students in the field to hold off on upgrading until they get back though – I don’t know if the iPad 1s they are on can handle those large files, but worth checking out. Thanks for this look at it. Interested to hear your thoughts on how the battery life on the ipad handled this process..? Was it able to handle the workflow without running down too quickly? Hi. I just bought Ipad 2 and would like to use it as a pro photographer. There is another great application called PhotoForge2 , you should definitely check it. But what I am really missing is the ability to upload more then one file at once.. I typicaly take 10 and more photos which I need to send to my Editor quickly via emai or some internet sharing server ( sorry for my English, I guess you know what I mean). Does Ipad somehow enables that ? I need fast and easy solution – like on my PC, to select and upload mutlitple files. Have a look at Filterstorm Pro – designed for Photo Journalists. Allows batch processing, the addition of IPTC metadata and transmitting multiple images at once – all for £10.49 GBP. Anyone know of a decent video editing program for the ipad2? I really want to know if I can forgo using a laptop on my motorcycle trips. We blog live from the road and I found a decent blogging app, now we are looking for a photoapp…will check out photogene and need a video editing app. just saw that..any others? Thanks and happy New Year. are you able to make slideshows? If not will this be an added feature? I bought Photogene in order to label photos of documents. I used it successfully a couple of times, but now it won’t work. If I call Photogene up first I no longer see any way to call up the photo I want to label. If I start instead with the photo I want to label and then invoke Photogene I lose the photo itself and can’t get back to it. Admittedly I’m a novice with the iPad. Have I accidentally changed some setting?